SPECIAL FEATURE: In a time when fewer Australians identify with institutional religion than ever before, the church sign is emerging as an intriguing platform for creativity and commentary. In recent times, church signs have become a stage for political commentary. In an age where most of our public debates happen digitally, and where welcoming public spaces for discussions are in decline, these signs provide an unexpected avenue for expression. Such signs were originally designed to make it easy for churches to display service times or bible quotations. But as the number of Australians who regularly attend church decreases, some signs have become a platform for politics, morality and humour. In his recent book, Outspoken, Father Rod Bower, an Anglican minister from Gosford, NSW, describes how he realised he could use the signs as a tool to encourage people to think about social issues. He has said that he believes his role as a priest and a Christian is to highlight human rights and social issues. In 2013 Bower felt troubled after administering the last rites to a dying man, whose family were uncomfortable disclosing the man’s homosexuality. In a gesture of support for the LGBTI community, Bower changed his church sign to read “Dear Christians, some ppl are gay. Get over it. Love God”. The sign went viral on social media. Bower realised he had found a powerful platform for rallying support for issues such as marriage equality, asylum seekers and climate change action. In this concise sentence Bower cleverly creates interplay between the online social media campaign (#BackTheBill), the physical platform of the sign in public space, and the social media sharing of the photographed sign. Bower has also used his signs to comment on debates around pill-testing at festivals. He posted the sign “When will we love our kids more than being right”, after conducting the funeral service of Alex Ross-King, a 19-year-old who died after taking drugs at a festival. Using its prime location in central Melbourne as a communication tool, St Paul’s Cathedral has also weighed into the refugee crisis, with a large sign on its wall that reads “Let’s fully welcome refugees”. The sign refers to volunteer work with refugees that happens inside the church, and urges Australia at large to be more welcoming towards those who come here seeking refuge. Some church signs are unintentionally humorous, such as one displayed by an Anglican Church on the Gold Coast. The sentence “Forgiveness is swallowing when you would rather spit” was meant to encourage people to swallow negative thoughts rather than spit them out. However, many had a more lewd interpretation of it. The same sign caused caused controversy in Florida, and in North Wales. Other churches purposefully use the signs to display a funny side of Christianity. On Twitter, for instance, the hashtag #ChurchSigns shows a plethora of signs that use humour to engage with the public. These signs are mainly from the United States, where there is a tradition of using church signs creatively. Many of the current signs focus on the dichotomy between religion and the digital world. Signs outside a church in my local town have addressed issues of digital technology and social media in an increasingly secularised society. They address current debates surrounding, for instance, data theft, and the superficiality of social media. On one poster, a giant “like” hand is pierced and bleeding. The sentence “Jesus more than likes you,” plays with the idea that Facebook “likes” lack depth and meaning in comparison to the deeper religious connections and personal relationship with Christ promoted by the church. IMAGE: Billboard outside St Andrew’s Presbyterian church, Murwillumbah NSW, 2015. (Louise Moana Kolff, Author provided). 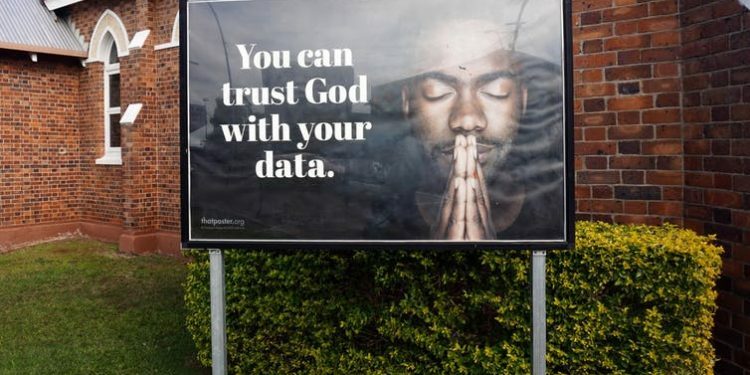 Another poster states, “You can trust God with your data”. As a response to recent scandals of data theft, the message conveys the idea that one’s innermost prayers are safe with God. This type of “religious marketing” cleverly taps into a loss of meaning that may be felt in contemporary society, and a growing distrust of media institutions. In a time when fewer Australians identify with institutional religion than ever before, the church sign is emerging as an intriguing platform for creativity and commentary. As countless public spaces are saturated with advertising, the position of the church in the centre of many towns allows the display of messages that make us think. This in turn may be a way for churches to increase their perceived relevance in contemporary society. These signs, though interesting interludes in public space, can only reach limited audiences in their physical form. However, the use of social media to publish them makes the distribution global. This interplay between physical and digital means that protagonists such a Bower can initiate important debates about the moral duties of society by carefully arranging a handful of plastic letters, and then sharing them with the world. TOP IMAGE: Billboard outside St Andrew’s Presbyterian, Murwillumbah, NSW 2018. (Louise Moana Kolff, Author provided).